Flush-mounted housing unit for downlights. One stop solution for achieving a safe, easy to install sealing system for downlights. Offered in either Maxi or Mini housing units. 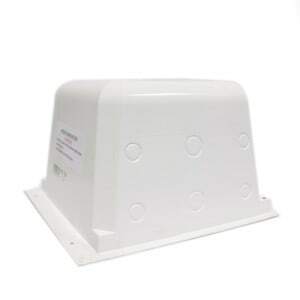 Designed to suit all types of roofs and ceilings and due to its size is very suitable for use in narrow places. Offers a solution addressing many issues which arise when specifying downlights. Simple to install by mechanically fastening the box to adjacent joists or noggins and can be used for most types of conventional timber ceilings. Optime Downlighter Protector Mini made especially for narrow spacings as it is only 200 x 200 x 140mm. Optime Downlighter Protector Maxi has a dimension of 320 x 320 x 160mm in order to accommodate a transformer. Optime Downlight Protector Mini/Maxi is made from inflammable and recyclable material. Tested for fire resistance to comply with stringent European Standards and it has the CE mark. Optime Downlight Protector Mini/Maxi is recognised by Nemko. Nemko is registered in the UK as a certification body for plugs, socket outlets and other electrical accessories tested according to standard BS 1363. Optime Downlight Protector Mini or Downlight Protector Maxi should NOT be relied upon as an independent fire resistant layer. The fire resistance of a downlight is determined by the fitting between the downlight itself and the fitting to the plasterboard. A transformer should not to be placed within the Optime Downlight Protector Mini, as the limited size of the box may lead temperature accumulation within the small box. The transformer should either be mounted externally or in the larger housing, the Optime Downlight Protector Maxi.